Badges Supporting Fallen Officers’ Families (Fallen) recognized long ago the need for immediate, direct financial support for the survivors of law enforcement officers killed in the line of duty. Our mission is to provide that support to the fallen officer’s family. In the last five years, our nation has suffered an average of 164 officer deaths per year, an “in the line of duty” death every 2.2 days. The impact on the officer’s family, friends, department and community is devastating. Our continuing support is critical as this need will sadly never disappear. HOW DO WE ASSIST FAMILIES? 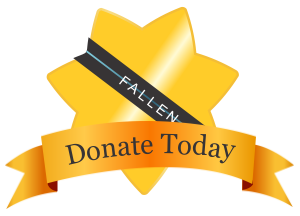 Fallen is dedicated to providing support anywhere in the country, 365 days a year. Within 72 hours of their loss, Fallen will deliver funds to the designated surviving family member of an officer killed in the line of duty. These funds can be used for whatever the surviving family needs such as assisting with the costs of funeral and burial arrangements, transportation for out of area family members, mortgage, other financial obligations, and any other unforeseen expenses. Our immediate, direct financial support is a one-time unconditional gift to assist the fallen officer’s family, which will bridge the gap until resources from federal, state, local or life insurance are made available. HOW CAN YOU BE A PART OF PROVIDING SUPPORT TO FALLEN OFFICERS’ FAMILIES? When you hear of a fallen officer immediately your thoughts turn to their family; you want to show support during this tragedy. Fallen has created a means for the entire law enforcement and civilian community to support fallen officers’ families during this time. Fallen strives to present a fallen officer’s family with financial assistance. This gift is made possible by a $25 annual donation by law enforcement officers nationwide and through generous donations from corporate sponsors and private citizens that recognize the sacrifice our nation’s law enforcement officers and their families make to protect and serve us.